As you can tell, I love to go to thrift stores, rummage sales, the home department in stores, and I usually find some great items for the table and home décor. Adding to my collections is fun, but I also pick up pieces here and there I mean to sell, if I can get the item(s) at a good price. Not every piece in my collection is expensive, and a table doesn’t have to have Spode, sterling and Waterford crystal to be stunning. This little set of china is proof of that. I found the set at a thrift store and fell in love with it, especially the little wheat motif as part of the decoration. 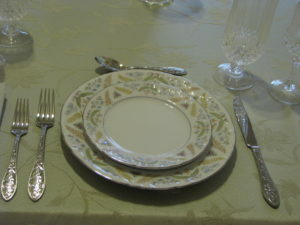 Made by Fine China of Japan, the Joanne pattern is perfect for a quiet summer dinner with friends. The flatware is Floral Lace by Temp-tations (QVC), and the crystal stemware is my beloved Longchamp by Cris d’Arques. The table cloth and matching napkins are Meadow Butterfly in Pistachio (Bed, Bath and Beyond). The centerpiece is simple, consisting of a pressed glass compote of unknown manufacture that I won on a bid at a local fundraiser, flanked by two ice-cream sundae glasses that may or may not have come from Havre Drug, which was owned by the original owner of my beloved Cottage (Julie’s Hallmark and Antiques in Havre purchase). It was a splendid evening enjoyed with some wonderful friends! Joanne by Fine China of Japan cover. I just love the wheat motif!